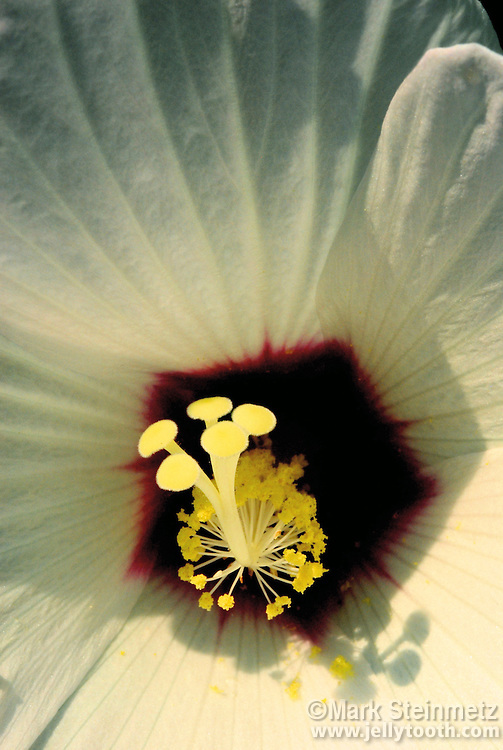 Close-up of Swamp Rose Mallow (Hibiscus moscheutos), aka Crismon-Eyed Rose Mallow. It is one of several Hisbiscus native to the eastern US. Found in marshes, swamps, pond's edges, and mesic soils. Blooms in Summer. Typically 5-7 foot tall plant, with flowers 4-6" wide. Stigmas with 5 rounded lobes. Related to cultivated Rose-of-Sharon.